I need to reinforce an old platform will be 20x12 feet 3 post 4x4x.250 in each side 3beam across ST4x4x.250. What is the capacity 8 feet high? Did you mean tube steel TS4x4x.250? 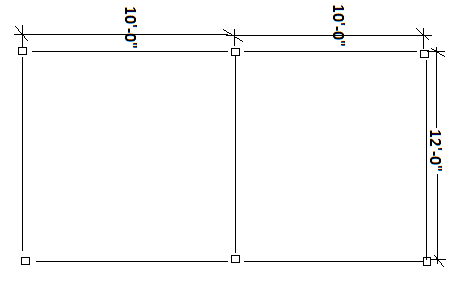 ST is a T of an S section beam i.e an S beam cut in half, very similar to WT as the T of a wide flange or I beam. The diagram drawn here is what I think you’re trying to build. I’m not too worried about the 8ft height you’re asking because tube steel vertically can sustain substantial amount of weight in upward of 20,000+ pounds per post is very common. Compare that to a 4x4 wood post which can sustain 6-8,000 pounds. My concern is using these tubes as beam because they are much weaker to carry load when they are placed horizontally. A TS4x4x1/4 has a section modulus of 3.9 cubic inches which will sustain much less weight when used as a beam than when used as a post. By following the same methods discussed in this website the TS4x4x1/4 can carry around 6,000 pounds which is a lot. This load does not take in to account the deflection limit if there is a limit of how far the member can deflect without compromising the occupants comfort level. By contrast a 12ft 4x4 wood post horizontally can only sustain about 400 pounds compared to 6000 pounds mentioned. The other factor that will play in the capacity of these steel sections is the grade of steel. The above numbers were based on 46 ksi steel, if the steel are A36 or other grade, the load capacity will be lower. For example an A36 tube can only carry about 5000 pounds. Since A36 is weaker and therefore expect to deflect more which can add another factor to the capacity limit.